Waddesdon Manor was built by Baron Ferdinand de Rothschild during the late 1870s, and he engaged James Pulham and Son to build him some rock features similar to – but ‘bigger than’ – those built for his friend, HRH Prince Edward, at Sandringham (see Chapter 8). The first project was on the Tulip Patch, at the top of a hill a short way away from the Manor, where they built brick caves, covered with natural rocks, in which to house the goats, and the second was the Water Garden, opposite what is now ‘The Dairy’. 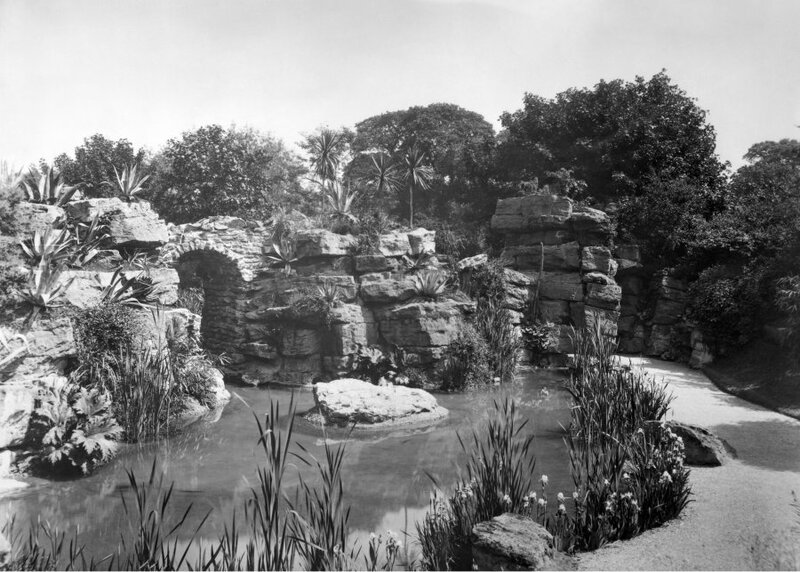 The massive rock structures there – which include a huge archway reminiscent to those at Madresfield Court – were mostly of Pulhamite, and they also built a small artificial lake and some more ‘goat grottoes’ so that the goats could be moved away from their original home on the Tulip Patch. The third section was around the Aviary, near the house, where they built a series of massive grottoes and caverns etc. As part of the Pulham Memorial Project, mounted by the Lowewood Museum in Hoddesdon, and part-funded by the Heritage Lottery Fund, a series of Site Video Tours was created of some of the Pulhams’ most prestigious gardens. Waddesdon Manor was one of these, and can be viewed by clicking here. Waddesdon Manor themselves have also developed an interactive video trail of their magnificent collection of Pulham Rockwork, and this can be viewed here. Enjoy your trip! . . .
A full description of the work done by James Pulham and Son at Waddesdon Manor – together with a number of pictures – can be found in Chapter 12 of Rock Landscapes: The Pulham Legacy – the critically-acclaimed and lavishly illustrated definitive story of the lives and work of James Pulham and Son. Written by Claude Hitching, with featured photography by Jenny Lilly. Published by Garden Art Press. Posted on August 25, 2014 June 9, 2017 by Claude HitchingPosted in Book ContentsTagged . . James Pulham and Son, Aviary - Waddesdon, Baron Lionel dy Rothschild, Claude Hitching, Goat Caves, Jenny Lilly, Pulhamite Archways, Rock Landscapes: The Pulham Legacy, Tulip Patch - Waddesdon, waddesdon manor, Water Garden - Waddesdon.